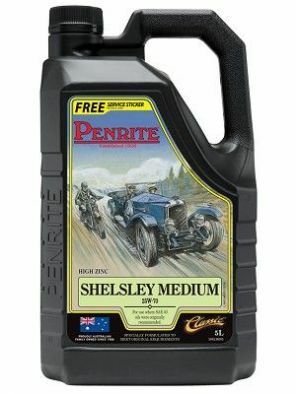 Penrite Shelsley Medium25w70 is a very low detergent engine oil intended for vehicles manufactured between 1920 and 1950. The oil contains additional corrosion inhibitor to protect against rust and corrosion during lay-up over non-use periods. A premium, mineral, SAE 25w70, high zinc, very low detergent multigrade engine oil designed specifically for petrol and diesel fuelled vintage, pre war and post war vehicles manufactured before 1950. It geatures a double layer of engine wear protection with high zinc and increased operating temperature viscosity over monograde engine oils. Recommended for use in vintage passenger cars, motorcycles, 4WD's, light and heavy duty commercial vehicles that originally specified an SAE40, monograde grade engine oil and were fitted with or without an engine oil filter. It is suitable for larger engined vintage and pre war vehicles which have either troughs or dipper type lubricating systems, or early types of pressure feed systems. It is also suitable for those employing total loss oiling systems and for larger capacity sleeve valve engined cars such as Minerva, Mors, Knight and Daiamler. Can be used for vehicles operating where moderate ambient temperatures will be experienced. Contains a "tacky additive" so that when the vehicles are laid up the engine oil doesn't run off the internal surfaces. This combined with an increased level of rust inhibitor, provides protection against corrosion and deterioration when the engine is not used or in storage.